THE day of the talking book, the talking newspaper and the talking magazine is foreshadowed in the recent invention of a French machine which reads from a strip of film-like substance any speech that is recorded on it. 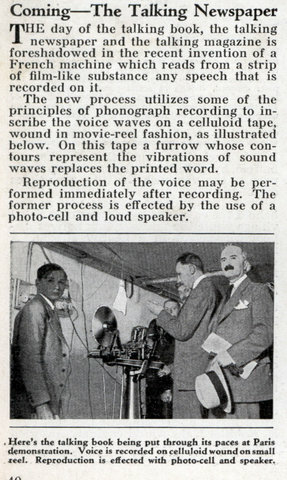 The new process utilizes some of the principles of phonograph recording to inscribe the voice waves on a celluloid tape, wound in movie-reel fashion, as illustrated below. On this tape a furrow whose contours represent the vibrations of sound waves replaces the printed word. Reproduction of the voice may be performed immediately after recording. The former process is effected by the use of a photo-cell and loud speaker. 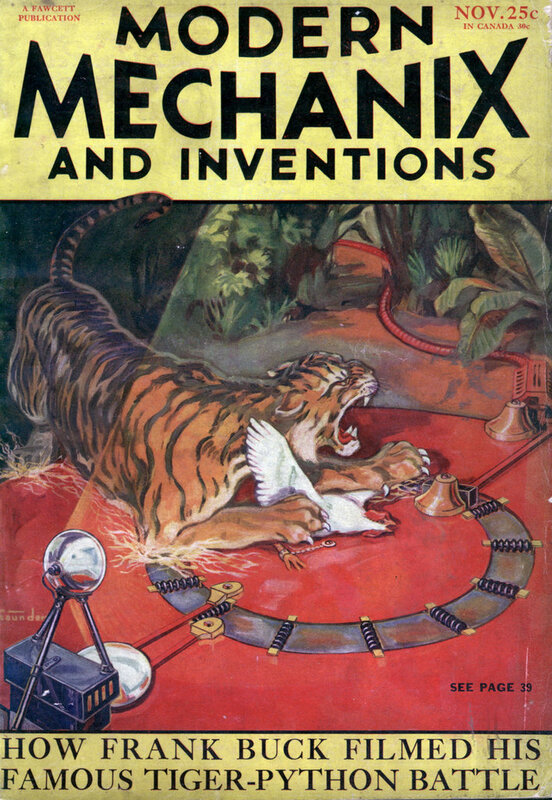 This looks like precursor to the optical track used later on motion picture reels. Mag(netic) stock came much later. My mom gets BooksOnTape from the Library of Congress. She just received her digital audio book player. Cassettes have been replaced with flash memory cartridges. Interestingly enough magnetic media, if replaced by flash, is going back to optical, such as CD and DVD. The article mentions “contours”, which in my mind sounds like mechanical recording. A kind of phonograph groove in a tape. This will never catch on. Why would anyone ever give up reading their morning paper? Mark my words, the daily papers are going to last forever! When I looked at that picture, I could have sworn at first that the two men on the left were Chamberlain and Hitler.